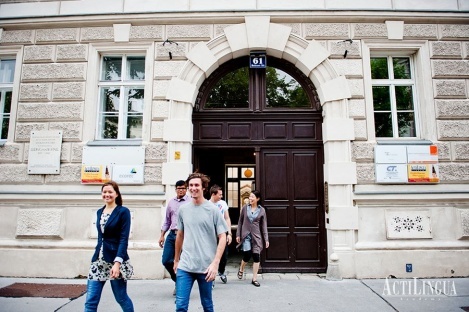 Office hours: Monday - Friday: 8:30 a.m. - 4:30 p.m.
•	Central location opposite Belvedere Palace – only 15 minutes from the city centre! •	Modern equipment: multimedia library with 20 workplaces with computers, free In-ternet and WiFi,student lounge and more! •	Year-round German courses in small international study groups, courses start every Monday, for total beginners once a month. 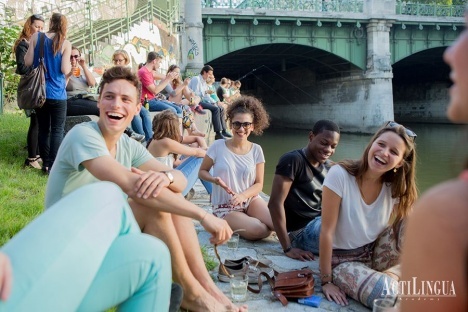 The Holiday Course for all teens aged 16-19 years is located right next door at the Acti-Lingua-Dependance Sacre Coeur and is aimed at students who prefer to spend time with their peers. 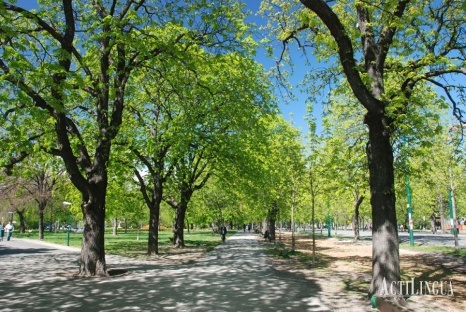 The Summer School for youth aged 12-17 is close-by, located in central Vienna and features a spacious park ideal for many sports and leisure activities. Our handpicked group leaders are available round the clock and put together an exciting and varied lei-sure programme. 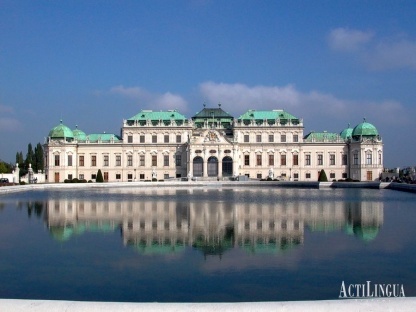 Cultural programme in the evening and on weekends, such as Vienna guided tours or a Viennese Waltz course, is included. The lessons take place in small groups, the average class-size is 8 to a maximum of 12 students. 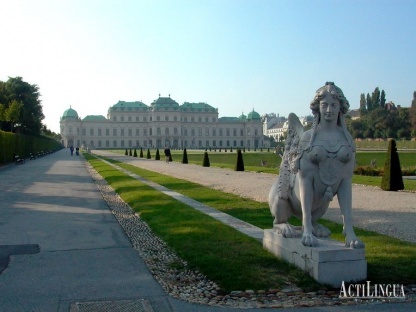 Afternoon and evening cultural and leisure activities included in the price present a many-sided view of Vienna and Austrian culture. 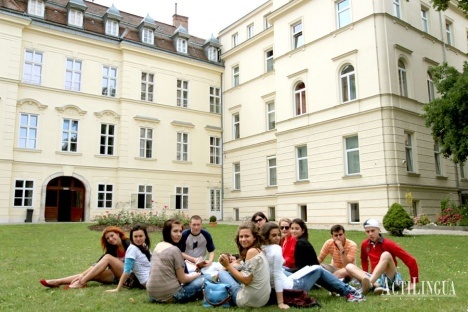 Standard apartments: You share a single or a twin room together with 2 - 5 other ActiLingua students. 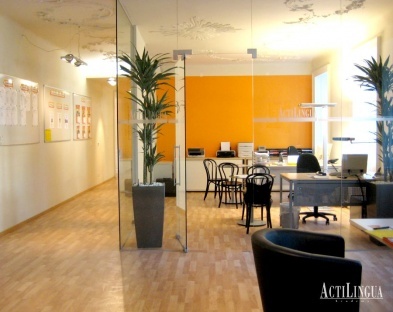 The apartments (60-75 m²) feature Sat-TV, radio, telephone as well as free W-LAN/Wi-Fi. Shared use of kitchen, bathroom and toilet. Rooms are cleaned twice a week. Bed linen is provided, please bring your own towels. Superior apartments: Own apartment for single use or for 2 persons (30-40 m²) with fully equipped kitchen, Sat TV, radio, free WLAN/Wi-Fi and your own bathroom and toilet. Rooms are cleaned Monday through Friday. Bed linen and towels are provided. 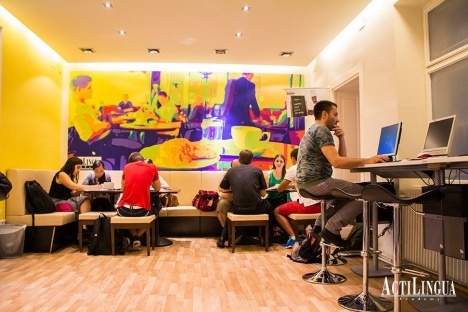 Recommendation for students who wish to stay in a very nice and comfortable establishment close to the city center. Completely self-catering with fully equipped kitchen or breakfast and half board option is possible. At Host Families and in the Student House it is possible to book breakfast or half board. Our Apartments are equipped with a kitchen in which you will find the most important utensils and crockery. 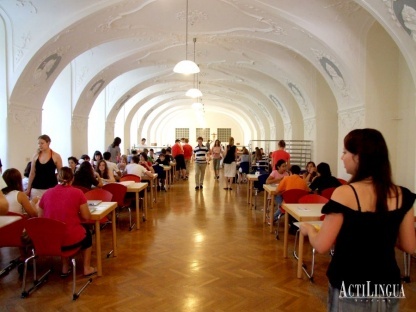 Modern school with 6 bright, welcoming, tastefully furnished and well equipped classrooms, in a typical Viennese Jugendstil building. 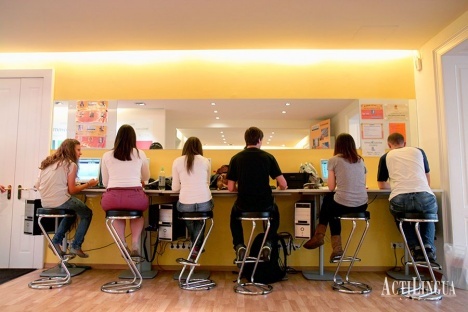 Between classes, students can meet at the ActiLingua multimedia library which features German-language literature and the latest issues of newspapers and magazines. You can watch videos or work at the computer. Courses also take place at the ActiLingua Dependence. Free e-mail and internet access for our students! 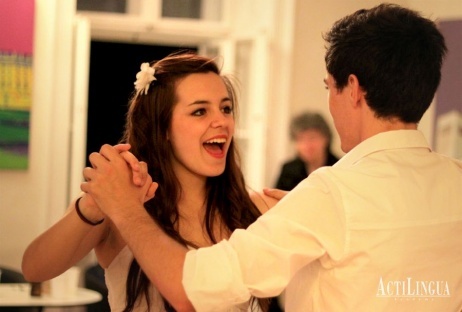 Included in the price are Vienna guides tours, Viennese Waltz course. 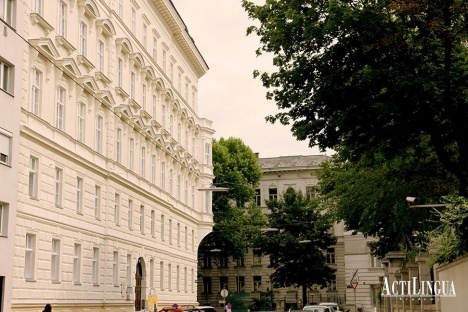 We offer special talks and videos about Austrian music, art, literature, history and architecture. 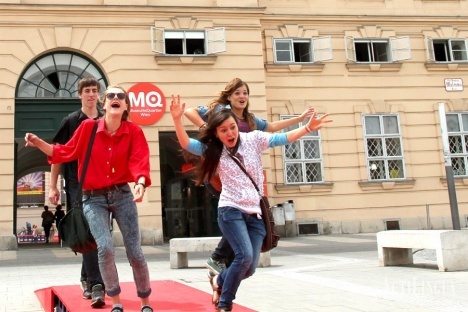 Films, tours of the many sights of Vienna and sports all form are part of this programme. On weekends we offer excursions to e.g. 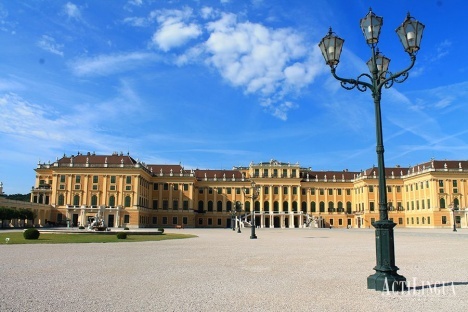 Salzburg, Bratislava, Klosterneuburg,... Excursions are paid directly in Vienna (cost price). In the afternoon and evening after class, we offer a varied leisure and sports programme. 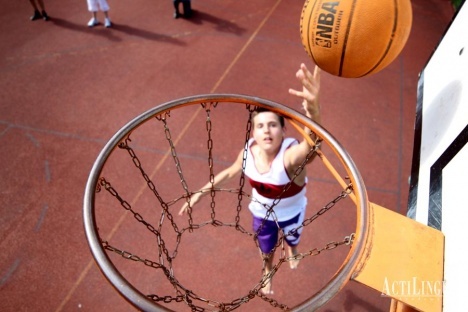 There are a number of sporting activities available; football, basketball or beach volleyball. 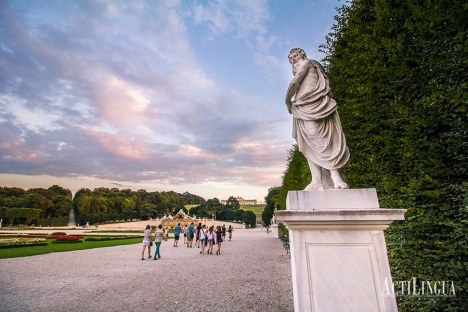 Group activities like our culture-quiz, Viennese Waltz course or guided city walks offer additional opportunities for speaking German and having fun with the accompanying teachers and class mates. Vienna by night, barbecue, disco. 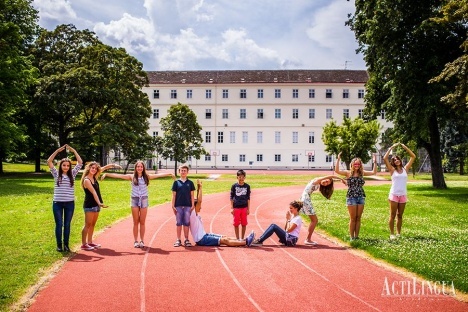 In our Summer School Vienna-Centre our teachers put together an exciting leisure programme on the school premises and show you the very best of Vienna. The leisure programme takes place every afternoon and evening. 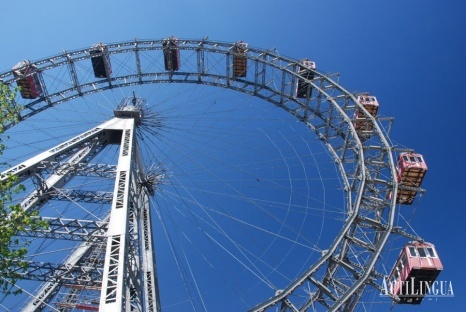 There are a number of sporting activities available: volleyball, football, swimming, table-tennis, "Olympic Games", visits to outdoor swimming pools and the Danube Island. You can do craft work, make music or go to waltzing lessons,or join a theatre group or newspaper workshop. Our staff organize excursions, films, shows, treasure hunts, barbecues, disco evenings, city walks, karaoke, welcome and farewell parties.